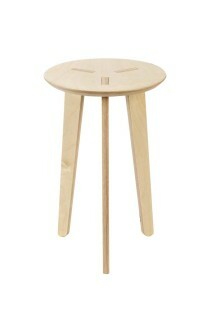 PRODUCT DETAILS Pregadio - Stool Description: stool. Measurements: cm 32*32*48 h Material: birch plywood. 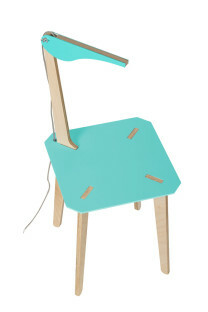 Finishes: Completely bleached birch or bleached birch and lacquered white, coral, teal, violet and blue. PRODUCT DETAILS ABI - Small table Description: Small table with customizable graphics on trays. Measures: cm 60*60*40 h Material: MDF (Medium-density fibreboard) and oak. Finishes: white matt. PRODUCT DETAILS Pregadio - Hanger dress Description:hanger dress. Measurements: cm 118*44*187 h Material: birch plywood and cut beech. 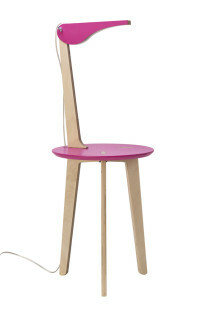 Finishes: natural birch and lacquered white, coral, teal, violet or blue. 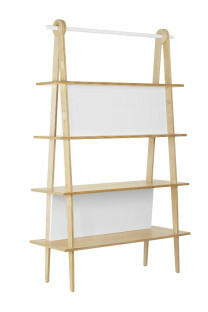 PRODUCT DETAILS Pregadio - Bookcase Description: library and exhibitor double face. 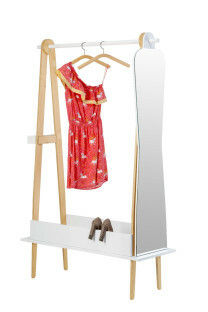 Measures: cm 118*44*187 h Material: birch plywood and cut beech. Finishes:completely bleached birch or bleached birch and white lacquer. 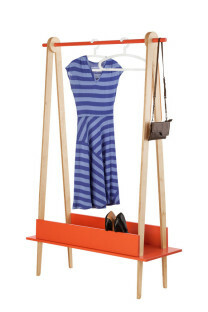 PRODUCT DETAILS Pregadio - Hanger dress kit Description: hanger dress accessories. Measurements: cm 35*144 h (mirror) – cm 25*9*6 h (wall pocket). Material: birch plywood and mirror (mirror) - birch plywood, metal, felt (wall pocket). Note: The color of the kit's accessories is the same of te hanger dress that you order. Description: A Tasche bucate element you can cunstomize in the internal division of spaces and the ability to close or not, the ends with swing doors. Finishes: natural birch or white lacquer. Description: five Tasche Bucate elements and a metal pole developed the height of the furniture. The edge of the base is closed with door. Composition suitable as division of spaces or placed in central space.